Just found your WEATHER CLOCK software while searching for a better way to have the temperature available on my system tray. I currently use WeatherBug and do not like it�s constant pop up windows and advertising. I also use a shareware date/time program TClockEX replacing the Windows standard clock. How great it is to have happened upon your software. It not only gives me the current temperature but also allows me to display the date/time and get rid of two software applications at the same time. 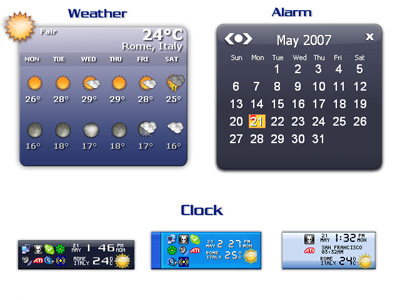 I am also impressed on how many options are available for configuration of the weather, temperature and date/time. The skins are an interesting addition allowing customization to the display. The additional features are also a great addition, alarm clock, calendar. I�m finding more to like every day I use it. The software installed easily with no conflicts to the operating system or any of my applications; the software is intuitive and easy to use. For what you get for your money, the software is well worth the cost. Place a clock with skins, calendar, alarms and weather on taskbar.